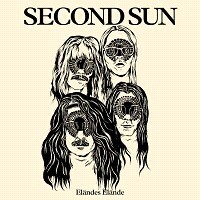 Swedish Acid Folk, Progressive, Hard Rockers "SECOND SUN" are back three years after releasing "Hopp/Förtvivlan" full length album which had a great success, with an impressive release called "Eländes Elände". Fronted by Jakob Ljundberg (Ex tribulation) they did evolve quite well since their latest release. Describing them is quite a hard job , there is so much to hear that one listen isn't enough. I heard some early JETHRO TULL, FAIRPORT CONVENTION, even some CAMEL too, all of them having a special place in my vinyl collection, so let's say i found them pretty good. Saying I loved the lyrics I would be the greatest liar of all time since they sing in Swedish. And i don't know a single note in Swedish! But the music is so creative and inspired that it could be only instrumental that wouldn't be a problem for me. All seems inspired pretty much by the sixties and the seventies. Another similar band comes to mind: DEAD MAN: an American band that you should listen to if you like "Second sun". That album was recorded in two parts since the band had a member leaving the band (Sofia)and hired David Grannas on guitar back then. If you listen to the album entirely you can feel a difference in the rendering, the second half is more punchy maybe, more tougher than the first one and this isn't a bad thing , it gives the whole thing a more wide experience. “Forneka Allt” offers quite a nice dose of jazz in this rock frenzy. “Noll Respekt” got superb hypnotizing keyboard parts and is quite an amazing song. Sonance here is so expanded and in a wide specter of the rock universe.Tempo changes and pace playing like a roller coaster made this listening quite an adventurous and entertaining journey. Hey guys let's say the truth here: not a language suits well and sounds good for rock. At first i must say i wasn't sure, but the way the songs are sung. It fits so well. It's like UK's Witchcraft that have this English accents that make them recognizable in thousands. For "Second sun" it acts like a trademark.And i know a few bands who sings in their native language but here it got something i can't put a word on it but it's well received. Singing in Swedish adds sunshine and sun rays through the haze and fog of this psychedelic rock extravaganza! If you like retro rock, heavy rock, psychedelic. Search no more. Anyway they'll find you.